A Tonk's Tail... err, Tale...: Saturday PhotoHunt: "Bliss"
*LOL* oh so cute! lucky cat! Oh my! That's just too funny! 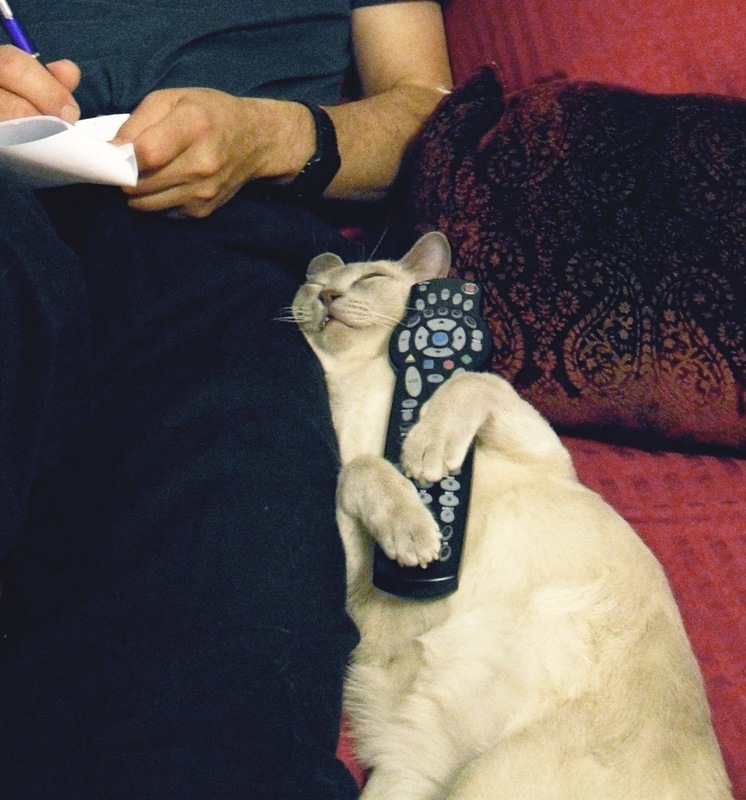 Oh you look so blissful cozied up to your human and holding the remote. Thanks for posting about the Saturday PhotoHunt. We wouldn't have know about it if we hadn't seen it in your blog. We participated too: Blissfully watching hummingbirds. oooh! We'll have to come over and look!! FaRADaY: *curious look* He sits on da bed and does homework too? I am betting you had some nip before grabbing that remote! ha ha - M is laughing her head off here cuz that is so funny and cute at the same time. That is so funny! A Cat that looks like my Daddy! FaRADaY: Yoo should TRY it sometime Nellie. I figured if it made Daddy so happy it oughta be great for me! Oh yeah...so you can watch Animal Planet!! You look a little *too* happy there, if you know what I mean and I think you do. Where's your stash man?? FaRADaY: SHHH! *looks furtively around* Don't out me! (MOL) Psst! It's under da pillow!